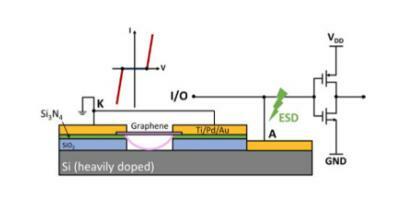 Researches from the University of California, Riverside and University of California, Los Angeles have demonstrated a novel above-IC graphene NEMS switches for electrostatic discharge (ESD) protection applications. This graphene ESD switch is a two-terminal device with a gap between the conducting substrate at the bottom and a suspended graphene membrane on top serving as the discharging path. This new concept provides a potentially revolutionary mechanism for the on-chip ESD protections. Researchers from the University of California, Riverside (UCR) and the University of Georgia have made use of three 2D materials – graphene, tantalum sulphide and boron nitrate – to create a simple, compact and fast voltage controlled oscillator (VCO). According to the team, this is the first useful device that exploits the potential of charge density waves to modulate an electrical current through a 2D material. Apart from having the potential of being an ultralow power alternative to silicon based devices, the device is thin and flexible, making it suitable for use in wearable technologies. But graphene’s potential has been limited by its inability to function as a semiconductor, and the researchers attempted to overcome this by adding tantalum sulphide (TaS2), which has been shown to act as an electrical switch at room temperature. The researchers then coated TaS2 with hexagonal boron nitrate to prevent oxidation. In the design, graphene functions as an integrated tunable load resistor, which enables precise voltage control of the current and VCO frequency. Researchers from Massachusetts Institute of Technology, Harvard, University of California Riveriside and US Army Research Laboratory have integrated graphene with silicon microelectromechanical systems (MEMS) to make a flexible, transparent, and low-cost device for the mid-infrared range. Tests showed it could be used to detect a person’s heat signature at room temperature (300 K or 27 degrees C/80 degrees F) without cryogenic cooling, which is normally required to filter out background radiation, or “noise,” to create a reliable image (which complicates the design and adds to the cost and the unit’s bulkiness and rigidity). 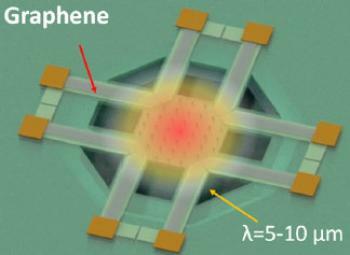 Researchers from the ICFO, ICREA, MIT and UC Riverside, have now showed that a graphene-based photodetector converts absorbed light into an electrical voltage at an extremely high speed. The efficient conversion of light into electricity is crucial to various technologies, from cameras to solar cells. It can also play a part in data communication applications, since it allows information to be carried by light and converted into electrical information that can be processed in electrical circuits. 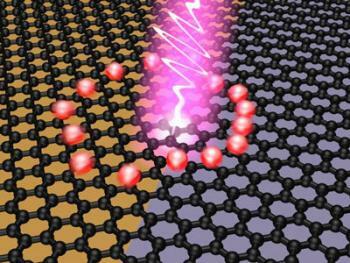 Graphene is known to be an excellent material for conversion of light to electrical signals, but it was unknown exactly how fast graphene responds to ultrashort flashes of light. The researchers developed a device capable of converting light into electricity in less than 50 femtoseconds (a twentieth of a millionth of a millionth of a second). Facilitated by graphene's nonlinear photo-thermoelectric response, the observation of femtosecond photodetection response times was enabled. Researchers from the Bourns College of Engineering at the University of California, Riverside investigated a strategy to improve lithium-sulfur batteries' performance by creating nano-sized sulfur particles, and coating them in glass. Lithium-sulfur batteries have been attracting attention thanks to their ability to produce up to 10 times more energy than conventional batteries, but one of the main roadblocks to implementing them is a the tendency for lithium and sulfur reaction products (called lithium polysulfides) to dissolve in the battery’s electrolyte and travel to the opposite electrode permanently, which causes the battery’s capacity to decrease over its lifetime. The scientists designed a cathode material in which silica (glass) cages “trap” polysulfides.. The team used an organic precursor to construct the trapping barrier.